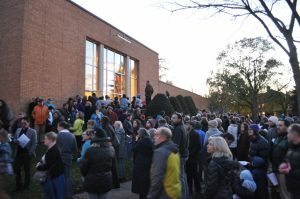 Macalester has long struggled to confront manifestations of hate on campus. Repeated incidents of anti-Semitic, anti-black and anti-Arab hate speech in public and private spaces around the school have left the campus community searching for an outlet to engage with the issue directly. March 27 through 29, Macalester hosted Naming Hate, a series of lectures, workshops, and panels centered around the history and manifestations of hate at Macalester, as well as different methods of coping with and responding to hate. The series began on Wednesday with a faculty panel in Davis Court featuring religious studies professor Nicholas Schaser, English professor Sierra Lomuto, biology professor Devavani Chatterjea and math, statistics and computer science professor Paul Cantrell. Giselle Cohen ’21 moderated. The panel began by discussing the relationship between hate and fear. “I think …what’s helpful is to reorient our thinking about this relationship between fear and hate as not necessarily fear of the other or difference, [but] it’s fear of the loss of power,” Lomuto said. “I think we see that really clearly in white supremacist ideology. We see that in the most recent example, the white terrorist attack in New Zealand… in the killer’s manifesto. Faculty panelists also discussed the place that conversations about hate have in a classroom environment. While they acknowledged the importance of professors making space for these discussions, some believed students have to take responsibility as well. The panel explored how community members should care for one another in the wake of hate and hateful events. The conversation turned to reflect on the act of naming hate itself. Chatterjea related this idea to acts of hate on campus — particularly the racist, Islamophobic and anti-Semitic graffiti found in various buildings during fall 2017 and 2018. Chatterjea recalled a story from her Catholic school experience. Picking up on similar themes of community accountability and institutional memory, Jennings Mergenthal ’21, Santiago Padrón ’21 and Zain Mahmood ’20 hosted the next Naming Hate event Wednesday night back in Davis Court. Mergenthal began the lecture, entitled “The History of Hate at Macalester,” by talking about Macalester’s earliest days. 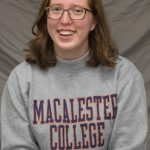 They began with the college’s founding in 1874 and particularly Edward Duffield Neill — Macalester College’s founder who engaged in settler colonialism and the establishment of the college on Dakota land. They continued by talking about integration at Macalester. “It’s also interesting to note that, while there is acknowledgement of the first international graduate, the first African-American graduate, there is no institutional recognition of the first Dakota graduate, particularly as the Dakota… were forcibly expelled from these lands to build, among other things, Macalester College,” Mergenthal continued. The group also discussed the Expanded Educational Opportunity program (EEO), which the college established in 1968 to provide scholarships and financial aid to socially disadvantaged students, particularly those students of color. The program, however, had a troubled history and was defunded in 1970 largely due to DeWitt Wallace revoking a significant amount of his financial contributions to the college. While students fought hard to save the EEO, even occupying 77 Mac in September of 1974, the program soon fizzled out completely. “All that remains of the EEO now is the alumni,” Mahmood said. Padrón shared an abbreviated history of hate crimes at Macalester — which they said tend to occur every four to six years. These incidents included personal attacks targeting individual students, as well as events like an off-campus “politically incorrect party” in 2007, where students wore, among other things, blackface and KKK robes. At the close of the presentation, audience members remained in Davis Court for another half hour to ask questions and continue the discussion. The following day, civil rights strategist and Executive Director at Western States Center Eric Ward came to campus to discuss his decades of work as an activist. After growing up in Los Angeles, California, Ward moved to Oregon, where he began organizing for civil rights. Years of activism have led him to a theory about the rise of white nationalism: it begins with the civil rights movement. “Imagine white superiority is just the way you believe,” Ward said during a lunchtime presentation at the Center for Religious and Spiritual Life. “For generations, it was like breathing air. Black people were inferior simply based on their skin color, in every way. You didn’t test that. You didn’t have to. It was natural. His argument is that following the Civil Rights Act of 1964, white supremacists and neo-Nazis sought a scapegoat for their failure to uphold white supremacy at an institutional level. Ward explained that white nationalism arose out of white supremacy as a different movement with different goals. “If white supremacy seeks to keep people of color and other marginalized communities at a disadvantage for the advantage of white folks, white nationalism seeks to remove people of color altogether. In short, white supremacy is a system of exploitation and discrimination, white nationalism is a social movement that’s bent on ethnic cleansing in the United States. These are two separate phenomena that we cannot conflate with one another. Conflating them confuses how we respond to them,” he added. Thursday night, Eric Ward gave a similar keynote address in the Weyerhaeuser Chapel. Entitled “Skin in the Game,” the speech was based on his seminal article of the same name, most recently updated in 2017. On Friday afternoon, Henry Aoki ’19, Stacy Gerondelis ’19 and Lealtad-Suzuki Center Director Jason Jackson hosted a coalition-building workshop in the basement of Markim Hall. Students broke into groups and made a list of actions they think the community and the college could take in order to improve the campus culture to a point where students felt more welcome and hate was denounced and dismantled on an institutional level. As the workshop went on, the moderators began to place more extreme time limits and pressure on the groups, forcing them to compete with each other to come up with better and more concise plans with each round. At the end of each turn, the groups had to collectively vote on who had the best action plan. After a while, one group became frustrated by the constraints and refused to partake in the activity any longer. Others expressed anger at the rules but continued to play along. At the end of the activity, the leaders revealed that the game was designed to imitate the feeling of organizing on a campus where resources are limited and groups who could be working together are forced to compete with each other. “This is why I love the workshop,” Jackson said. “It exposes the human condition where we will fight for resources… We are socially constructed to believe there are different groups of people… race, gender, all these different types of things. We buy into it and we hold steady to it. After the workshop ended, students again remained to continue the discussion amongst each other. Reflecting on the effects of the workshop and of Naming Hate as a whole, Jackson said that the value of events like these comes in the conversations they spark among students. Naming Hate organizers Anael Kuperwajs Cohen ’21 and Juliet Kelson ’20 want to prioritize keeping this conversation and the spirit of Naming Hate alive. While the individual events were well-attended, an even larger swath of students engaged with Naming Hate’s Instagram campaign — in which the organizers photographed students writing their own pledges to tackle hate. In a few weeks, they plan to follow up with these students to ask if they’ve stayed true to their promises. Kelson and Kuperwajs Cohen hope to make Naming Hate an annual tradition in the interest of supporting Macalester’s institutional memory and continuing to educate new students about the history of hate and the future of coalition-building. “The events themselves finished but [the work is] never done,” Kelson said. “In the presentation about the History of Hate at Macalester, there was the topic of something big that happens every five or six years and then fades off and plateaus. Students interested in working on Naming Hate in the future are encouraged to contact Kelson and Kuperwajs Cohen.